Description: This impressive four-armed image represents Bodhisattva Avalokiteshvara, can be identified by Amitabha Buddha on his head. 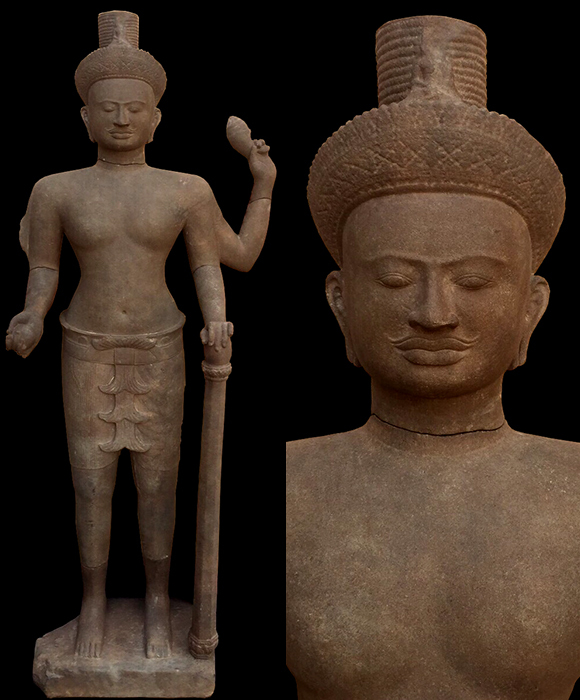 Stylistically, the image is transitional between the Khleang and Koh Ker styles. The Bodhisattva wears a pleated Sampot with a sash terminating in triple-fishtail panel in front in the Khleang style. The hair is twisted and arranged in horizontal rows to form a Jatamukuta marked with with concentric circles of hair on top which is Koh Ker style.